It’s Time to Sound the Alarm! The American Red Cross is getting ready to Sound the Alarm against home fires. From April 28 to May 13, thousands of Red Cross volunteers and partners will install 100,000 free smoke alarms in just 16 days in communities at high risk for fires. American Red Cross Desert to the Sea CEO Linda E. Voss on why she’s joining Sound the Alarm! The Home Fire Campaign is credited with helping to save 416 lives. 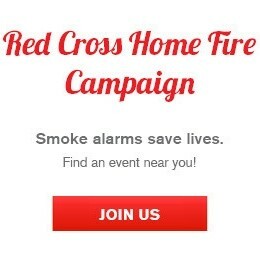 Red Cross volunteers and 4,400 campaign partners have installed more than 1.2 million smoke alarms. 3 million people have been served through visits to more than a half-million homes. More than a million children have been reached through specially targeted programs. Jimi and Stevie know the importance of having smoke alarms and a fire escape plan in place. They experienced a home fire where they lost their home, but luckily their whole family – including their two dogs – got out safe due to a visit from the Red Cross just one year before. “[The Red Cross] installed the smoke alarms for us, and talked about the fire prevention, and also the fire escape plan, which was the major issue that saved our lives and got us out of the house in time,” said Jimi. Watch Jimi and Stevie’s life-changing story here: https://vimeo.com/265792441. Join the Red Cross to help families like Jimi and Stevie’s and fight against home fires today by volunteering to install smoke alarms in your community, making a financial contribution at redcross.org, or taking two easy steps to help save lives – practicing fire drills at home and checking your smoke alarms every month. Together, we can Sound the Alarm about fire safety and help save lives. Learn more at soundthealarm.org/dts.